Vatican City, 14 February 2013 (VIS) – This morning in the Paul VI Audience Hall, the Pope met with pastors and clergy of the Diocese of Rome, accompanied by Cardinal Agostino Vallini, vicar general, and the auxiliary bishops of the diocese. Before entering the hall, they had processed into St. Peter's Basilica to make a profession of faith at the altar of the Chair. 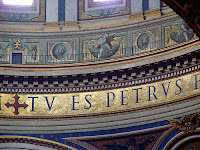 Benedict XVI was greeted with the hymn "Tu es Petrus". 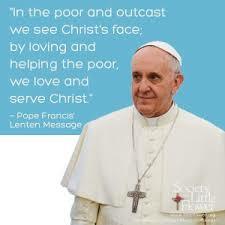 "Thank you all for your affection, for your love for the Church and the Pope. Thank you!" the Pope said, before being greeted by Cardinal Vallini. "For me, it is a special gift of Providence," he continued afterwards, "that, before leaving the Petrine ministry, I am able to see my clergy, the clergy of Rome, one more time. It is always a great joy to see how the Church lives, how it is alive in Rome. We have pastors who, in the spirit of the Supreme Pastor, guide the Lord's flock. It is a truly catholic clergy, that is to say, a universal clergy, and this is the same essence of the Church in Rome: to bring universality, catholicity, to all peoples, all races, and all cultures." 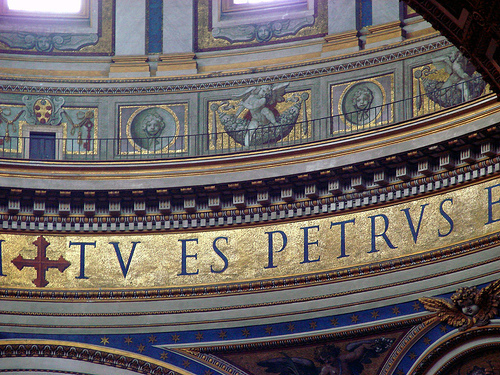 "Today you have professed the Creed at the tomb of St. Peter. In the Year of Faith this seems to me a very appropriate, and perhaps necessary, gesture that the clergy of Rome gather around the tomb of the Apostle to whom the Lord said: 'I entrust my Church to you. On you I will build my Church'. Before the Lord, together with Peter, you have professed: 'You are Christ, the Son of the living God.' Thus the Church grows, together with Peter, professing Christ, following Christ. It is what we always do. I am very grateful for your prayers, which I have felt, as I said on Wednesday, almost physically. Even though I am now retiring, I will always be near to all of you in prayer and I am also sure that all of you will be near to me, even if I am hidden from the world." 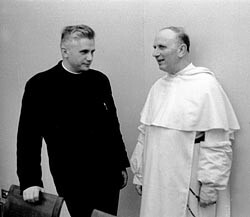 ﻿Father Joseph Ratzinger, the future Pope Benedict XVI, is seen with French Dominican Father Yves Congar during the Second Vatican Council in 1962. Both served as council experts, but one bishop thought laypeople could serve as experts too. Then the Pope spoke to those present in the Paul VI Hall about his personal experience during Vatican Council II, as the priests had requested of him.